From the infinitely large to the infinitely small, this short animated series explores in ambitious ways the dizzying mysteries of the universe, observes humanity under a microscope and propells the viewer into a world where man was never the center. At a time where man cannot see futher than the end of his Tweet, this film invites us to take a few minutes to think outside of ourselves. Since after the COP21, consciences have quietly put themselves back into hibernation mode, the film offers another reminder and pushes everyone to question their relationship to nature and their surroundings. This mini-fresco of the Universe will be accompanied by an immersive soundtrack, a voiceover that will make your hair stand (if you have any) and graphics which will beautifully and intelligently capture and portray the universe : a film that will bring everyone to their feet. Insignificant, First, this is the encounter between two free thinkers who have discovered the missing link. Franck Courchamp, researcher at the lab Ecologie, Systématique et Environnement (UPSud/CNRS) and Clément Morin, graphic artist and animated 3D film director. Two experts with complementary skills and knowledge. Franck Courchamp is a world renowned researcher : Senior Director of Research at the French National Center for Scientific Research (CNRS), he is also a member of the Academia Europaea of Sciences. Specializing in conservation biology and having over a hundred scientific articles published in international scientific journals, he also has strong experience in popularizing his work. His particular style, captivating and accessible, made his book “Ecology for Dummies” (in French) successful in 2009. In 2015, he participated in the creation of the 90 minute film “Planete Corps” for Arte (a German/French TV channel), which has already received four internantional awards. For his new project; he opted for an animated 3D film, the format best suited to the particular message of this project. His meeting with Clément Morin confirmed this choice. This movie director and experienced motion designer has to his credit the production of many short films, in which the artistic quality and technical know-how are outstanding. In a similar project, Clément Morin has already reached more than one million combined views for the clip Hootsuite. There will be at least two versions of this movie. A French and an English one, and likely having subtitles in an unreasonable number of other languages, from Spanish to Korean; including Tamoul, Swahili and Klingon. Ok no, maybe not Klingon. Insignificant will be comprised of nine episodes of three minutes. Three minutes to put away your selfie stick and take the time to receive a true message. Each episode will take us into a different graphic universe, punctuated with surprising facts, impressive numbers, and fascinating scientific anecdotes. From the universe to genes, including ecosystems, species and the human body; each episode addresses a different aspect of science. 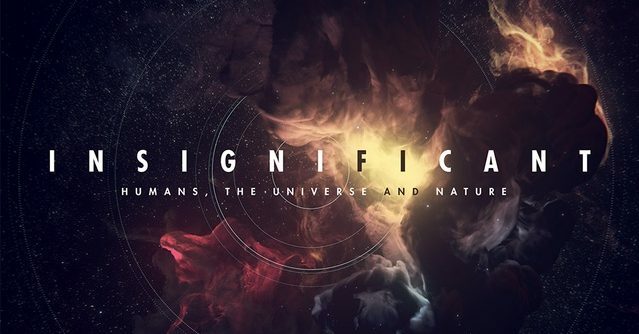 Thanks to the use of meaningful metaphors, powerful images, and an original soundtrack, this animated film allows us to reflect on scales and concepts that are large and difficult to comprehend for our human brain: the number of stars in the universe, the proportion of Earth’s history where man has been present or the number of living species on Earth. An evocative power reinforced by beautiful visuals. Because one often says that a picture is worth a thousand words – and an animated image is worth even more – the 3D animations of Insignificant are a particularly effective medium to convey this message.